One of the main purposes of the Pablo Casals Festival is to promote new talent and to make live music come alive. On April 11th, the 6th edition of the ‘Concours International de composition du Festival Pablo Casals de Prades’ will take place at 18h in the sale du Foirail, Prades. This competition gives young composers the opportunity to present their inspiration and their music, with the possibility of playing in public in the Abbey of Saint Michel Cuxa. Since 2005, every two years, nearly 500 composers worldwide (Europe, Australia, USA, China, Brazil …) have offered new works written for training, from trio to sextet. In tribute to great cellist Pablo Casals, the jury imposes the cello as the instrument of choice. Seventy scores were studied in late 2014 by members of the jury, composed of Marc-André Dalbavie (composer), Barry Douglas (piano), David Philip Hefti (composer), Michael Lethiec (Clarinet), Vladimir Mendelssohn (violist ), Arto Noras (cello) and Jörg Widmann (composer), and three compositions were picked out. On April 11, 2015 these three pieces will be performed by the Ensemble Calliopée and recorded professionally. 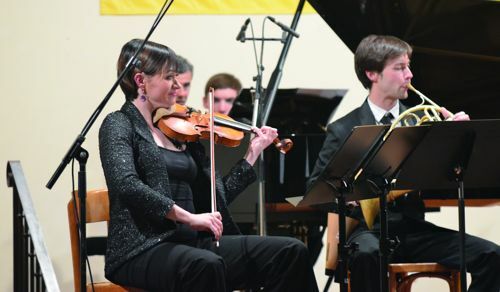 Members of the jury, after deliberating behind closed doors at the end of the concert (free admission), will decide on the winner who will take away a prize of € 12,000. – Alors donnez-moi votre sac à main.